I'm leaving the ice and going somewhere warm!!! Hi guys, thanks for all the nice comments on my last post. 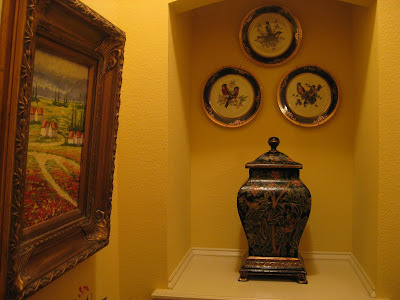 My Nanny did have some beautiful things, I forgot to mention the column with the urn next to the mirror was hers too. I sure do miss her! 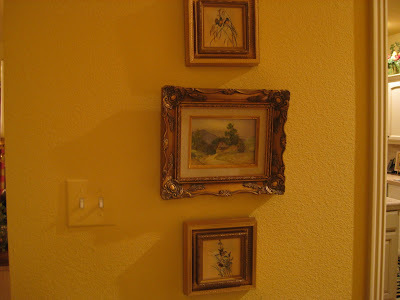 I enjoyed seeing what's on your walls too! I will definitly be participating again. 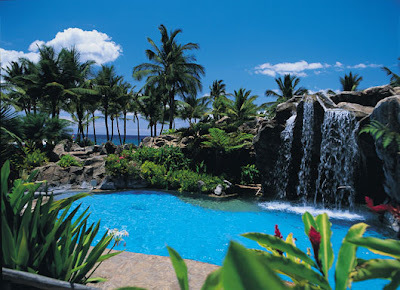 Sunday I will be leaving this cold weather and heading to Maui! I can't wait! Chase especially can't wait, he's never been on an airplane so he's excited about that too. It's an 8 hr. flight, so I bet he will get tired of it pretty quick. lol! He is bringing plenty to do...including homework! Several months ago Lynette tagged me for 5 things I've always wanted to do and one of them was to go to Hawaii. I also mentiond that my parents were going in Feb. and I was hoping they would take us with them, well......they are! My brother and his wife are going too. This will definitly be the trip of a lifetime and I will take lots of pics! I wish you all could come with me! Hubby is taking the computer so maybe I will do a post while I'm there. My Etsy store will be on hold for a week, but you can drop me an e-mail if your interested in something and I will ship it out when I get back. Thanks again to mom and dad for taking us on this awesome trip!!! 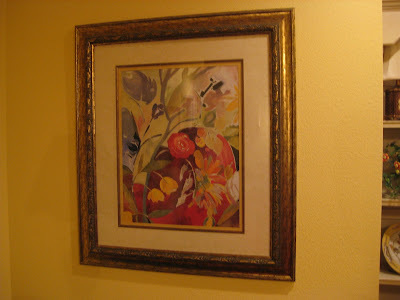 "What's on your wall Wednesday" and more frames! Hi everyone! 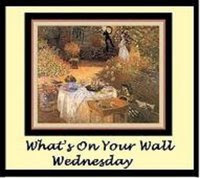 Welcome to the first "What's on your wall Wednesday" hosted by Barb http://gritsglamour.blogspot.com/. What fun! 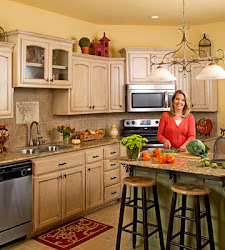 She has a great blog with lots of wonderful ideas, please pay her a visit! These are some pictures that I recently inherited from Nanny. 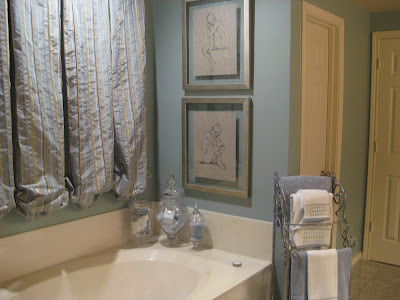 This watercolor hung in her bedroom. The birds hung in the diningroom. 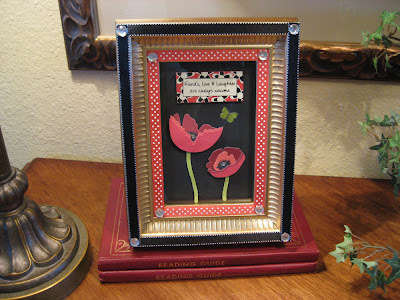 I glued them in another frame to make them a little larger. I love plates on the wall. 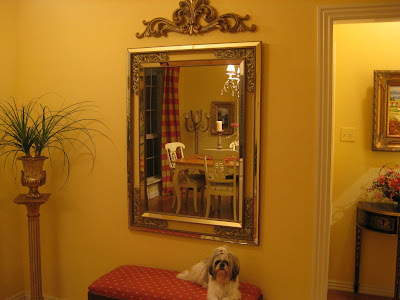 This niche was supposed to be a closet, but Sherry suggested this to add a little more character to the house. 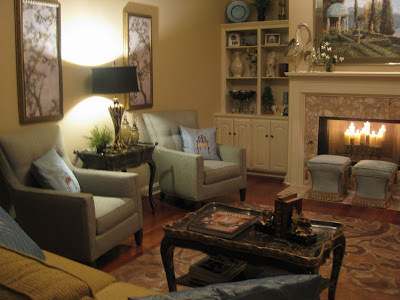 Remember..... we built this house off a model home so there are many more people in the area with the same floorplan. We tried to add some things to make our house a little different. 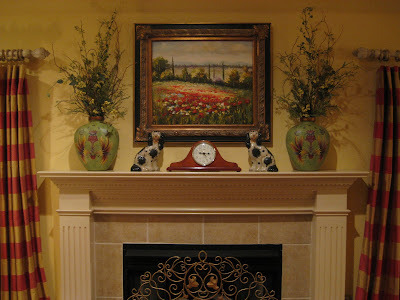 The oil painting is similar to the one on the mantle. I just love colorful landscapes! This picture is one of my favorites! I was intantly drawn to it (at Kirkland's) because of all the color. Mom got it for me for my bithday when we moved into the house. It's a little contemporary..... honestly, I like contemporary, I tend to like lots of different styles! I'll have to show you more on a different post. My house isn't big, I need something to show you next time! lol, Great idea Barb! Now for more frames...... This is what I came up with for the initials. Of course there are many different colors this one could be done in. I did this one to match my house. I can do any initial you would like! 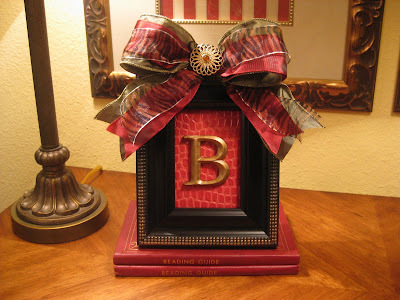 This one has 3 different ribbons and a B on snake skin paper. 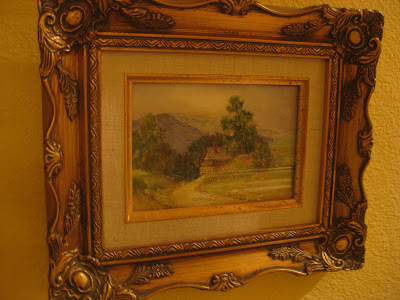 I painted the edge of the frame gold. 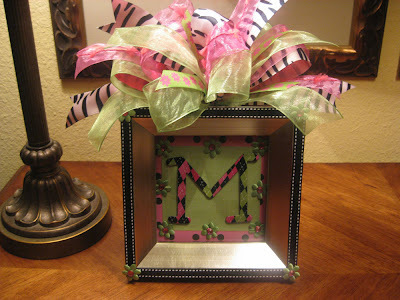 When Sherry and I went to market we saw some frames with rhinestones in the middle of the bow. They were so pretty (and pricy). You guys suggested dog frames. I found the rhinestone paws at market and came up with this. 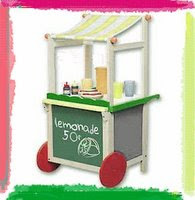 You can put your own picture in this one, it can be for a dog or cat! 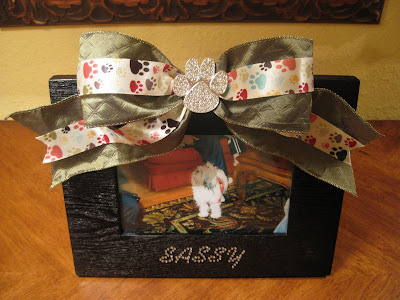 I can also put your pet's name in rhinestones like I did for Sassy. I will also be making some in different colors. 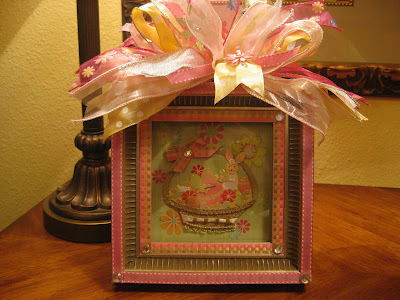 I also have rhinestone Fleur de lis, butterflies, hearts, crosses and adorable baby carriages I will be making soon. This isn't the best pic of Sassy.....everything is still on my camera! I think we are all ready for spring!! And easter.....what a wonderful time of the year! I will be listing these on my Etsy store if you are interested. My store is listed under "My Links" right under "My Followers" on the left hand side. If you have a special request just let me know! 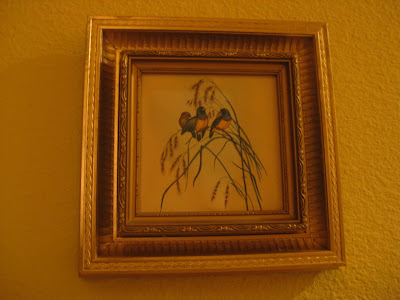 Thanks again to Barb for hosting "What's on your wall Wednesday!" I hope I can blog tomorrow, we are in the middle of an ice storm and I'm just hoping the temps stay up so the ice will melt. Hopefully our power won't go out! Have a great week! 2 awards and a tag! I can't believe how fast this week flew by! I agree that the older you get the faster time flies. It seems like I just got back from Dallas and that's been almost a week ago! 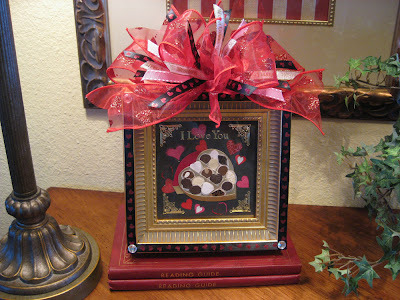 This first sweet award is from Melissa at http://melissasheartandhome.blogspot.com/ . She has become a really good friend over the past several months and I'm honored she would pass this special award onto me. 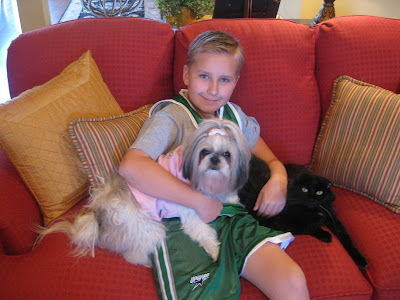 I am a mom of one 9 yr. old boy Chase, but also a mom to my cat, Coco and my dog, Sassy. Of course I love Chase the most. LOL! I try to be a good mom, but of course I have many flaws. The other night my mom skills were tested when Chase puked all over the bed and the bathroom floor at 12:30 in the morning. Yuck! I was in such a deep dreamy sleep too! I know Tootsie went through this just recently with her kids. 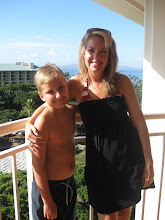 It's all part of being a mom! Luckily it wasn't a virus, we don't know what it was, but right after he puked he was fine. I hope you weren't eating when you read this. lol! Here they all are before Chase's basketball game yesterday. 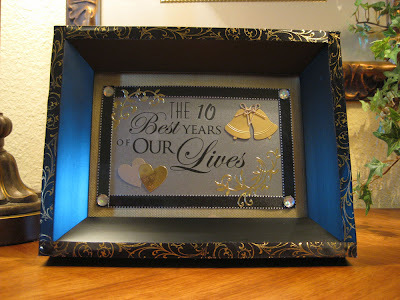 I would like to present this award to Tootsie at http://tootsietime.blogspot.com/ and Michelle at http://fromhousetocozyhome.blogspot.com/ I would pass this onto more of you great moms, but I think you've already received it! Thank you Michelle for this sweet award! I try to have a great attitude and I know I have graditude that you all come to visit me!If you have received this award just know that I think you all have a great attidude and show lots of gratitude! I was also tagged by Diane at http://fourpawsco.blogspot.com/ . I was a little nervous about what I would find. LOL!! No.....I just hoped it wasn't some awful picture with my mouth wide open or better yet....one of my mom, she would kill me! I was hoping to have something more interesting! This was taken at Christmas last year. I did get a bigger tree this year, but everything was decorated basically the same. I guess I should have cheated and showed you something more interesting.lol! I tag Donna at http://designson47thstreet.blogspot.com/ and Dawn at http://dawnieslifeifbythesea.blogspot.com/ I know I'm a little late posting this one and most of you have already been tagged. This was a fun one! I will have more frames on my next post. I have a few done, but wanted to make some more before I post them. Look for that post Tues. or Wed. Have a great week!! Hey everyone! I've been in Dallas for the past several days and have missed reading your blogs. I'll have to catch back up with you all soon. 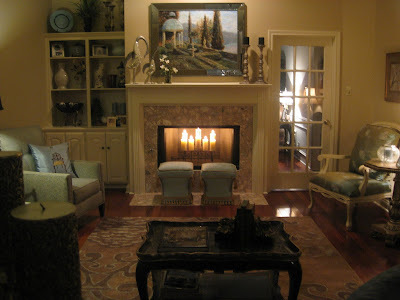 I have some pictures of my friend Sherry's house and a peek inside the Dallas Market Center to show you. 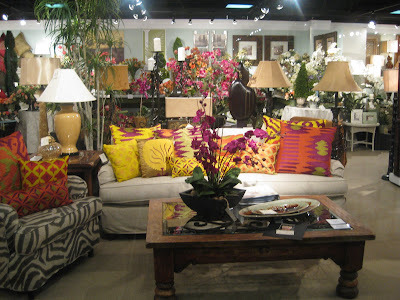 Some of you know I used to work for Sherry when she owned an interior shop. We have been going to market for almost 10 years. Even though she doesn't have the shop anymore, she still has clients and a store up north that she buys for. 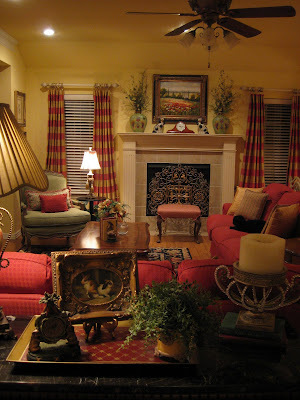 First, I want to show you a few pictures of her house in Dallas. She is still working on it, but it is looking beautiful! I posted some pictures a few months ago, but she has added some things since then. The blues and creams are so soothing. 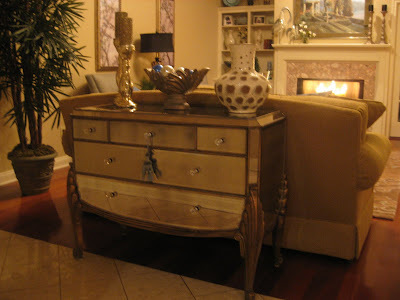 This mirrored chest is gorgeous! This is the master bath. It's still in progress, but is going to be beautiful!! 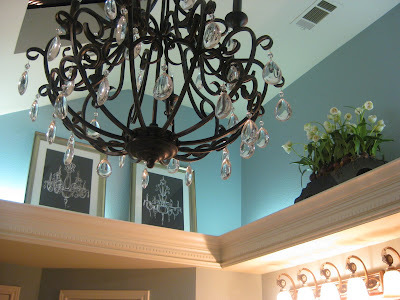 I just love this chandy and the tops of the cabinets! Question?? She has a shower door that is gold metal around the edges that she would like to paint silver. Has anyone ever painted one before? Now lets take a short trip to the market center. You can't tell alot about it in this picture......but it is huge! 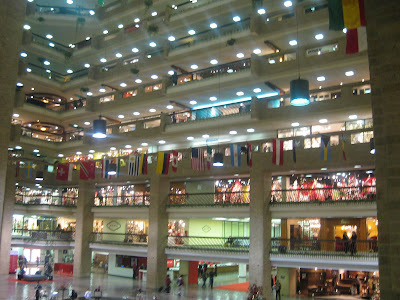 There are 5 buildings including the apparel mart that total 5 million square feet!! 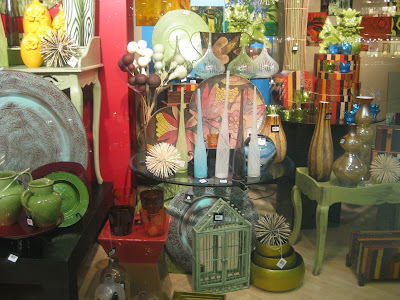 Lets peek into a few windows to see what's in...... lots of color in this showroom. 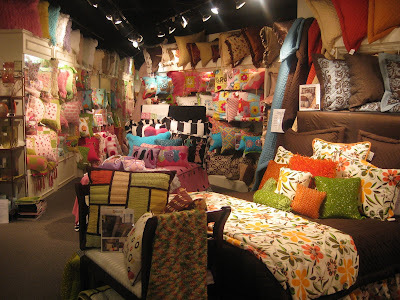 Look at all the pillows.....more color! 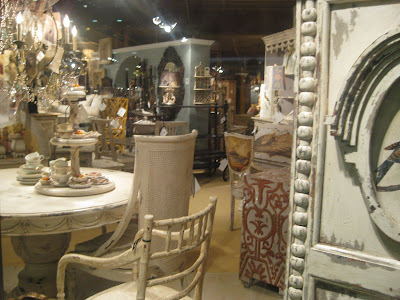 Shabby Chic is so pretty! 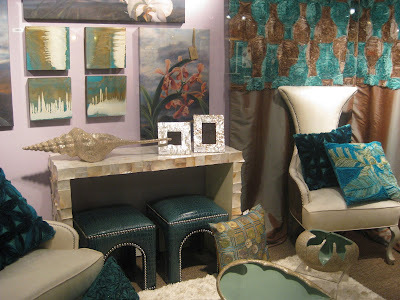 More bright contempory...... Orchids are definitly in! The browns and blues are everywhere.....look at that giant shell! Anything relating to the ocean is in too. It looks like just about everything is in right now.....just do what you like!! I bet it's hard for shop owners to know what to buy right now because of the economy. Lets hope our new president will make some much needed changes. I will be making more frames and posting them soon. Thanks again for the encouragement and ideas. I hope you are all having a great week!! Hey everyone, Thanks so much for your input and ideas on the frames. I really appreciate all the great feedback!! 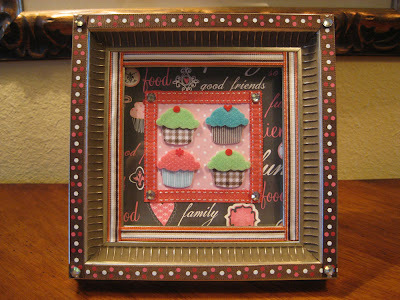 Several of you suggested pet themed frames, I am still looking for just the right embellishments for them. That was a great idea by the way! 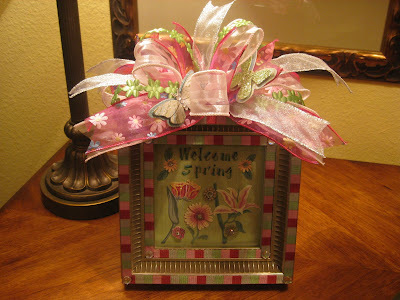 I am still working on many more....including easter, garden, purses, butterflies, dance, and cooking. Keep those ideas coming, I would love to hear from you! Valentine's day is coming up.....Wasn't it just Christmas?? Some of you suggested Anniversary......I could custom make this one. Cupcakes are the thing right now, wouldn't this one be cute in a kitchen? Melissa suggested initials. These are for a little girl's room, but I will be coming up with some others soon. I'll store it here for now! Thanks for taking a look! I'm having so much fun making these, it's like cordinating a room! If you are interested in purchasing one, my Etsy store is on the left hand side under "My Followers". I hope everyone is having a great week! Creative juices are flowing again! Hey Guys! 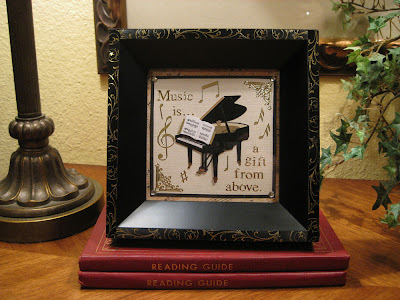 Some of you know I make these 3d frames and a few of you have even purchased some of them . I was mostly making Christmas but have been trying to come up with some everyday items. After the holidays I kind of went through a little spell where I didn't want to make a thing! I would go to all the craft stores and just stare at stuff. Finally, I got a few ideas. 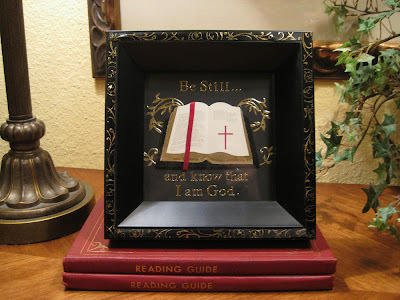 I've made the wedding and bible frames before. I'm just trying to come up with ways to make them different. I am going to show you 3 frames I have recently made and am in the process of making more. 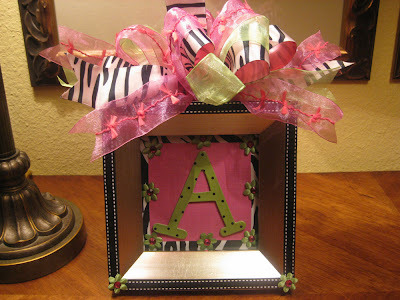 I am also going to be making some hanging initials for little girls rooms too. These frames are listed in my Etsy store. 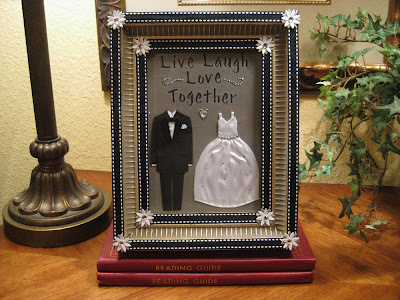 The first one would be perfect for a wedding gift! Remember you can click on them to enlarge. Wouldn't this one be perfect on a piano? 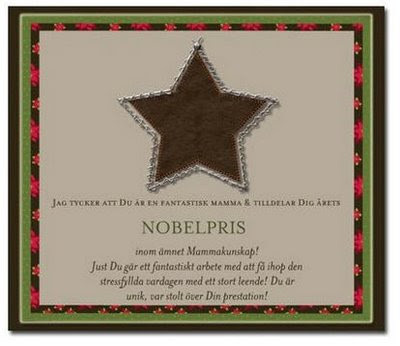 I made one similar to this for my mom and she loves it. This is one of her favorite verses. I will show your a few more things I'm working on soon. I just wanted to post these to let you know I do have these available for sale, but also to give you ideas. Maybe you will want to make one for yourself. There are endless possibilities! I would love to know what you think and maybe you have some ideas you could share with me. I would love to hear them! My Etsy store is listed under "My Links" on the left hand side under my followers. Mantle mini lift and 2 awards! Hi everyone! I hope you are all having a wonderful start to the new year. 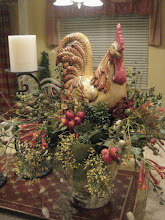 I have been busy with my family from Kentucky, taking down Christmas, cleaning and getting things back in order. For a while I could not see the light at the end of the tunnel. I had the biggest mess you have ever seen. I took pictures, but decided to spare your eyes! lol! I did enjoy it when it was up though. Anyways, I was a little tired of the other green jars on my mantle so I went to Hobby Lobby and found these green vases on clearance for $13 each!! I was so excited! Luckly I had the floral pillow in the green chair with me so I knew they had the right colors . They had a few nicks, but nothing a little paint couldn't fix. I bought a little bottle of darker green paint and sponged it on. I was a little worried about how they would look with the painting, but I think they work. As you guys can see, I do love color and lots of different patterns. I did try a few different things on the mantle, but ultimately Noah's ark syndrome took back over. lol! Here is a picture of the room back in order. Coco's comfy! 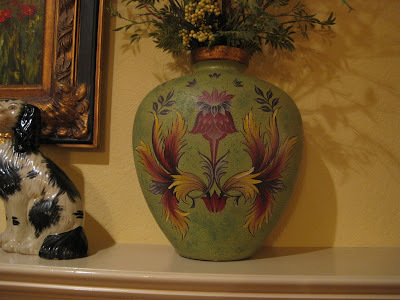 Here is the one of the vases up close. I just love the design! 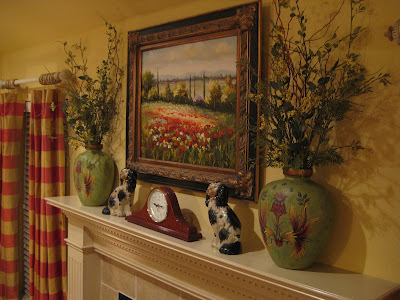 You can see the old green vases on my header. 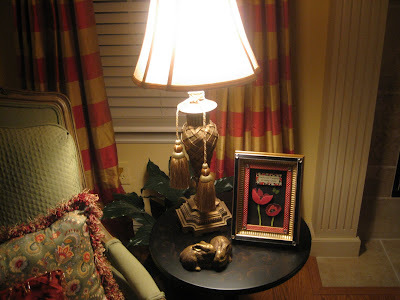 This one is from Linda at http://royaltouchart.blogspot.com/ and Lynette at http://lynetteslam.blogspot.com/. Thank you so much guys! I'm honored! 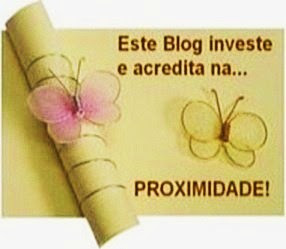 This award focuses on the friendships that blossom here in blogland. "Blogs who receive this award are 'exceedingly charming' say its authors. This blog invests and believes in the PROXIMITY-nearness in space, time and relationships. These kind bloggers aim to find and be friends. They are not interested in prizes or self-aggrandizement. Our hope is that when the ribbons of these prizes are cut, even more friendships are propagated. Please give more attention to these writers! Deliver this award to eight bloggers who must choose eight more and include this cleverly-written text into the body of their award." The 8 blogger buddies I give this award to are........by the way, if you have already recieved this award, you do not have to post it again. Just know that I really appreciate you friendship! Now for my next award! This one is great too, I don't know about fabulous though. LOL! 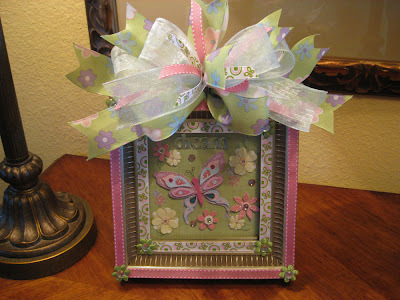 I recieveved this one from KD at http://southernwhimsy.blogspot.com/ Thanks KD!! Here are the rules...1) Add the award image to your sidebar.2) Copy and paste the rules and instructions in your post.3) When posting on receiving the award, make sure you include the person who gave you the award and link it back to them.4) Post 5 of your addictions.5) Post 5 winners and link it back to them as well.6) Let your winners know you gave them an award by leaving them a comment on their blog. I pass this award on to.......again, if you have this award you don't have to repost it, just know that I think your blog is Fabulous! Thanks again guys for the awards! New Year's Eve celebration in the bathroom! I hope you all had a Happy New Year! Kevin and I went to dinner while my mom and dad took Chase to a movie. I had babyback ribs. Yum Yum! 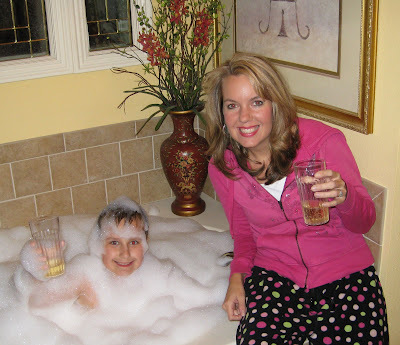 When Chase got home we watched some of the celebrations on T.V., and around 11:30 he wanted to take a bubble bath. At midnight I brought in the Sparkling grape juice and we had a toast! Chase was a prune by the time he got out! I really need to work on the settings on my new camera, we have red eyes!